Most computers and mobile devices have built-in microphones now, and they are fine for phone calls and video calls. They fall short when you need a higher-quality audio for podcasting or recording music. There are a variety of microphones on the market, from cheap stalk microphones to studio-quality mics costing hundreds (or thousands) of dollars. 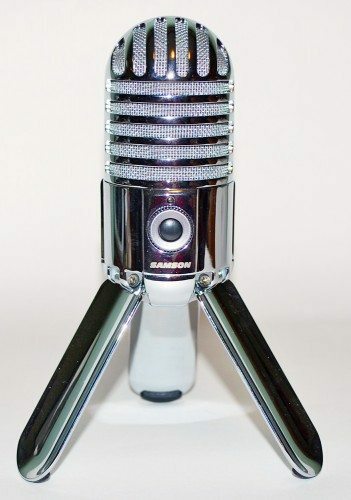 The Meteor Mic USB Studio Microphone from Samson promises to be a “professional, large diaphragm, studio condenser USB microphone” at a reasonable price. How does it stack up? 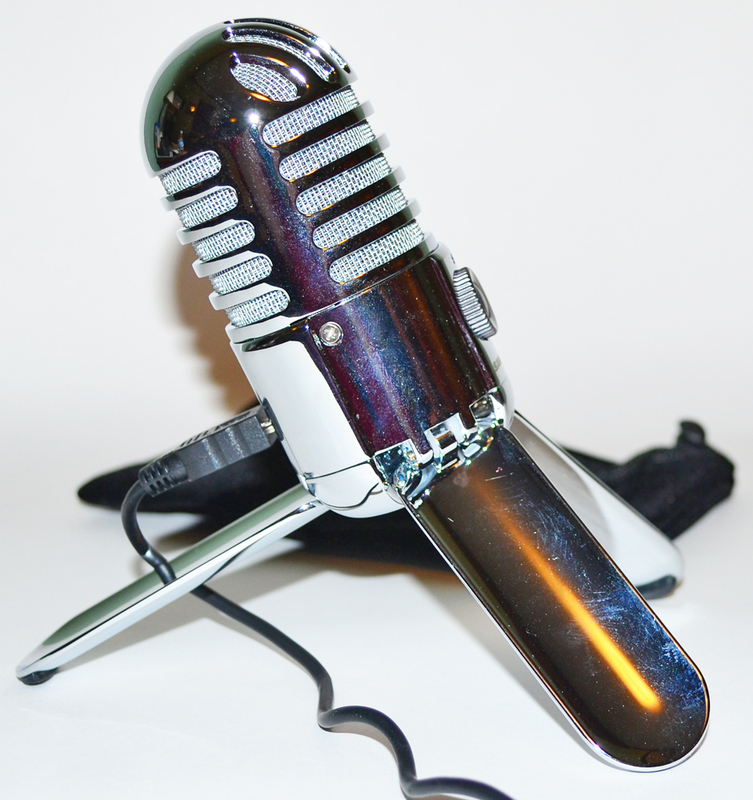 The Meteor Mic has a retro look that harkens back to the 1930s. It folds up into a compact 3.75″ long capsule with an approximately 2″ diameter. Its chrome-plated body and fold-away legs are sleek, shiny, and beautiful. The legs have rubber tips to keep the mic from sliding. When the legs are fully extended, the Meteor stands about 6″ high. It’s small enough to take with you, and at 9.9 ounces it won’t be too heavy a burden. 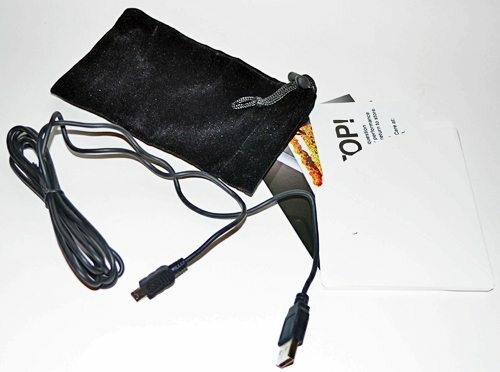 It comes with a velveteen storage bag, an approximately 6-ft USB-to-miniUSB cable, and a manual and booklets. 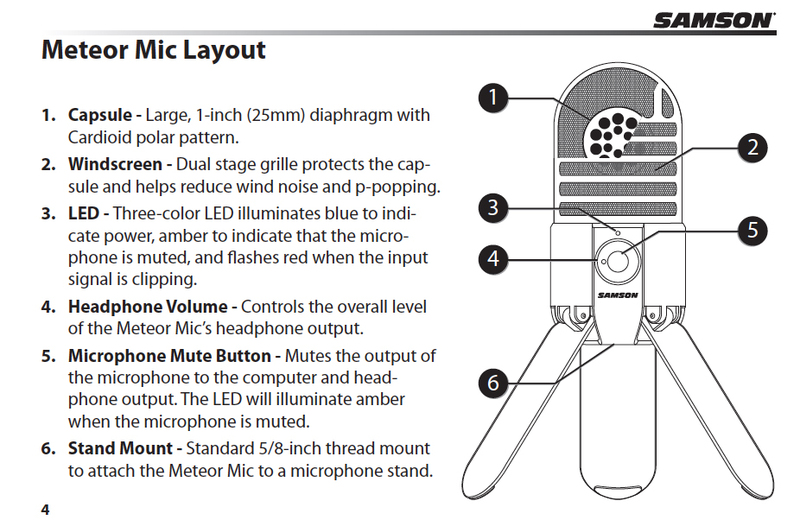 The Meteor has a dual-stage grill, as seen in the diagram above, to protect the 1″ diaphragm and to reduce wind noise and p-popping (the explosive sound you can get when saying words with “p” in them). The legs can be adjusted to find just the right angle for your audio source. Or you can use the standard 5/8″ thread mount to attach the mic to any microphone stand. The front of the microphone has a black plastic mute button. The dial surrounding the mute button is the volume adjustment for the headphone output. The LED shows blue when the microphone is powered, amber when muted, and it flashes red to show when the input signal is too loud and is clipping. The Meteor works with both Windows and Mac computers, and it required no drivers when used with my MacBook Pro. 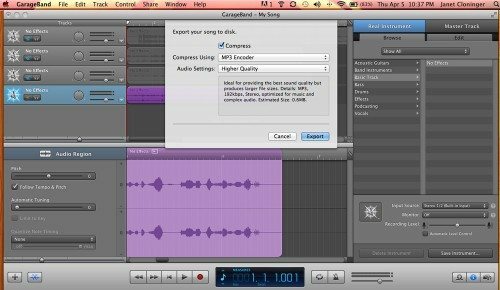 It’s also compatible with most computer-based digital audio workstation software. I have GarageBand on my MBP, so that’s what I used to make some recordings. I simply plugged in the Meteor Mic, started up GarageBand, and I was ready to record. Because of the limited formats supported in WordPress, I saved all these files as MP3 files, at the highest quality available. The microphone is suitable for recording voice (speech or singing) and various acoustic musical instruments. For voice, you should position the mic so that the center line on the front is pointing to your mouth. You can rotate the center line away from your mouth a bit to minimize p-popping, or you can use a microphone pop filter. 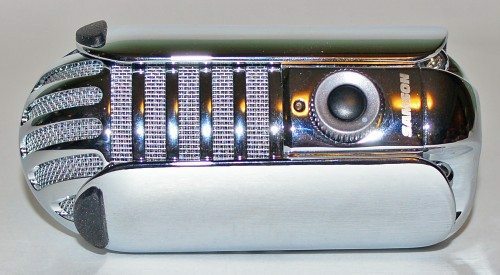 The closer the microphone to your mouth, the more the bass response increases, according to the user’s guide. The microphone is short, and you may find it difficult to use it on a tabletop with just the built-in legs and still be able to have it the recommended 6-24 inches away from your mouth. The legs don’t fold together enough to be used as a handle for the mic, but I still decided I’d use the front leg as a handle for my voice recordings. I don’t have a microphone stand. I made two speech recordings. I made them sitting in the bedroom of my house, with everything as quiet as I could make it in the room. Because my house is beside a busy, cross-town road (runs within 30 feet behind my house), there was the possibility of traffic noise that I couldn’t control or block. Both recordings were made with GarageBand, using all standard settings. I made one recording using the MBP’s built-in microphone and one with the Meteor mic. When I listened to the recordings, I used my Sony MDR-NC200D headphones. I turned on the noise-cancelling function so I that could block ambient noise while I was listening. You can hear a definite difference between the two recordings. Both recordings seemed to be clear and static-free, but I felt the Meteor recording was richer and fuller, especially when I was holding the mic about 6″ from my face. The built-in mic recording sounded more like voices sound over the telephone than when you’re talking face-to-face with someone. I asked my husband, Butch, who is an amateur musician (trained pianist and a guitarist), to also listen to these recordings to see what he could hear. He also used the noise-cancelling headphones for playback. He agreed that both recordings were clear and static-free. He said he could hear some background noise in the recording made with the built-in mic, and my voice sounded flat. With the Meteor mic held six inches from my face, he said the recording sounded like my actual voice, and he said the recording was fuller and had a presence that sounds that of a radio announcer recorded in a studio. When the Meteor was pulled away from my mouth, he said he could hear some background noises, but the Meteor recording still sounded better than the built-in mic. I asked Butch to play some music for me to record so I could test how well the Meteor mic works for acoustic music. We followed the instructions for placement of the meteor mic, and we set the MacBook Pro in the same position when we recorded with its built-in microphone. Again, I listened to these files with my Sony headphones with the noise-cancellation turned on. The guitar recorded with the MBP’s built-in microphone sounded too bright and harsh. The guitar recorded with the Meteor Mic sounded more like the way it sounded when I listened as we made the recording. I could still hear the highs, but the bass was fuller and warmer sounding. Butch says in both cases, he could tell he “was playing an acoustic guitar”. But with the Meteor Mic recording, he could tell he “was playing Rachel’s 3/4-sized guitar with the buzzing fret.” With the built-in mic, he said the treble is artifically bright. He says the Meteor Mic doesn’t lose any of the bass, and the recording sounds to his ears just as it sounded as he recorded it. Butch also tried out the monitoring feature as he recorded the guitar tracks. He used the same Sony headphones plugged into the jack on the back of the Meteor Mic. He said there was no lag or delay in the sound through the headphones. 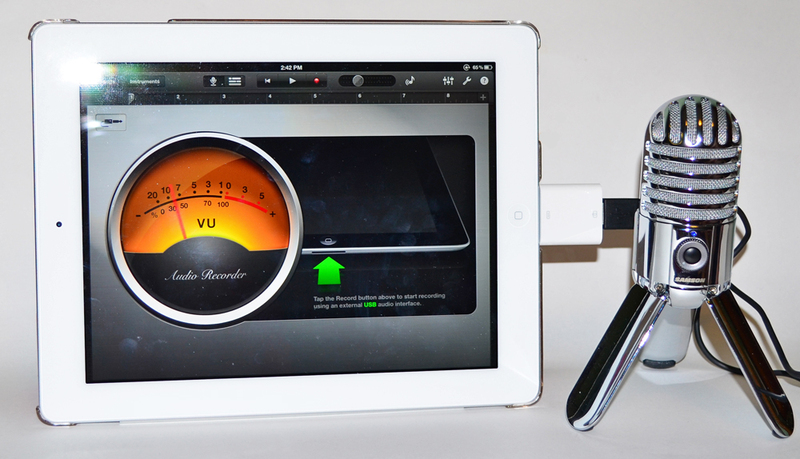 The Meteor Mic can also be used with an iPad. You have to use Apple’s iPad camera connection kit to connect the mic’s USB cable to the iPad, and I happened to already have a connection kit. I also already had GarageBand for my iPad. I plugged the microphone into the iPad, as shown in the picture above, and I was ready to record. I was talking as I took the photo, and you can see the needled is blurred because it was in motion as the photo was taken (click for a larger view). I used all the standard settings and made all the same recordings on the iPad that I had made on the MacBook Pro. GarageBand on the iPad has more-limited file format selections for saving, so I saved the recordings as M4a files. These are supported by WordPress, but they may not play for all of you. I’m including only one file recorded on the iPad. Butch and I both used the Sony headphones to listen to the files recorded on the iPad, some using the built-in mic and some using the Meteor mic. We both agreed that there’s not a lot of difference in the recordings using the iPad’s built-in mic and the MBP’s built-in mic. 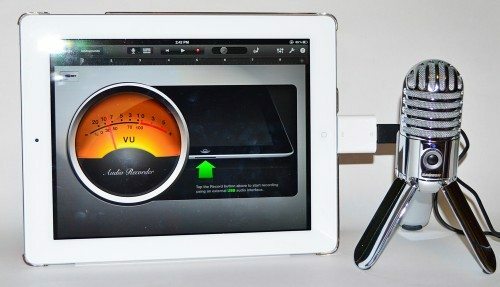 The Meteor mic files sounded very similar, regardless of whether they were recorded on the iPad or MBP, and in both cases, they sounded much better than the built-in mic recordings. I remember saying during one of the voice recordings using the Meteor mic that the recording level needle was in the red zone, but we didn’t hear any distortion in any of the recordings. Just one note about playback: On the MacBook Pro, I could select the output source for monitoring/playback. I could use either the MBP or the Meteor for playback. On the iPad, I couldn’t find a way to change that, and only the headphone jack on the Meteor could be used for playback while the mic was connected to the iPad. Whether you want to record vocals or acoustic instruments for music, voice for podcasts, or you just want to sound better for Skype or Face Time, you can’t go wrong with the Meteor Mic. At a list price of $150, it’s a high-quality, moderately-priced microphone that will improve any recording or VoIP call you make. May be shallow to say, but it's beautiful! Thank you for a good review. I only wish you could have found a way to post the audio samples without requiring Abode Flash. Especially on a device that might be used with an iPad. @jpdanzig, it’s a mono mic. Nearly all high end mics are mono mics. If you want a stereo mic, you buy two of them and record to separate tracks. 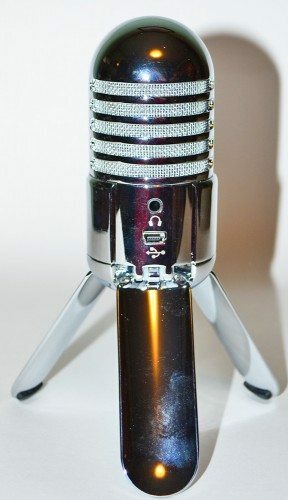 The rare high end stereo mics are sold as a pair of mono mics. 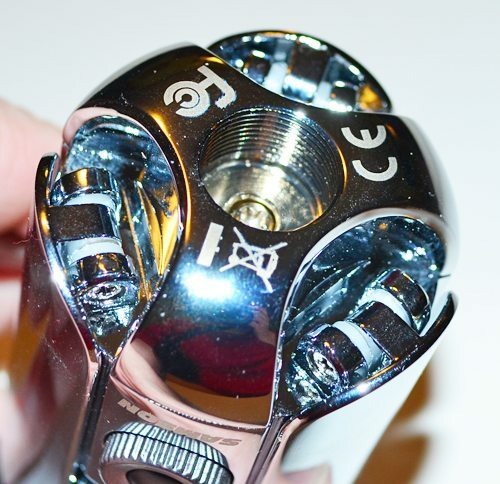 That is, a high end stereo mic is really two mono mics that happen to be made at the same time, to guarantee identical components during manufacture. @thsu Thanks for answering jpdanzig’s question. @Steven Lue Thanks for the kind words. Sorry about the Flash, but I was trying to work with WordPress. going video, especially we prefer to only be heard and not seen. @Fran Smith, practically any good USB microphone from an established audio company, like Samson or Blue, is going to work incredibly well. I use Samson mics at home and at work, different styles, and they all pick up conversations even 10-15 feet away. Our remote offices said the mics were the best purchases we’ve ever made. Good news. Have you ever used it while on FB for enhanced conversation? That is the most practical application in my case. Do you expect the price to be reduced anytime in the near future? Thanks for showing this item. I find it really wakes up the DJ side of my personality! Just got this mic today. Worked for a little bit using GarageBand with IPAD, but then stopped working. It’s just displaying a red light now. Bottom line, it doesn’t work. I understand sometimes things don’t work and that’s fine. But Samson doesn’t have any customer support to try and resolve the issue or any guidance on what is specifically happening to cause this error. Their user manual is nowhere near sufficient on info and they don’t even have a FAQ section on this product. Ridiculous. This is one of the best product reviews I have read in a long time, perhaps ever. Your in-depth review of this mic is very much appreciated. Thank you so much for sharing your experience with samson meteor, Now i have no doubt to buy it! Excellent review, thanks! I purchased one a week ago, am very happy with it. I use it for conferencing with co-workers. This mic is probably overkill for that purpose, but I’m glad that I got it. I use it every day, so to me it was worth it. Beats the company-issued headset! Your reviews were really helpful to me. I am beginners; basically a linguist having various assignments on Voice over. I am planing to buy SHURE PG 42 for my home recording so that i can minimize the cost for studio recording. However; i want to deliver professional sound. Would you please guide me further? what all accessories do i need beyond just a microphone? Looking forward to hear you soon! May i ask if im able to use the meteor on the samsung galaxy tab ? I want to be able to record and edit it on the tab . Soo..I didn’t really get what I expected to get with this microphone. You see, I am and singer and I play acoustic guitar. Well, I know know to make music videos also. So I thought it would sound like something Tiffany Alvord would make or something after going back with some music software. Something professional. Ya know, sounds like it was recorded in a studio. On this microphone, I came to find out that you can absolutely tell that it was recorded in a home. Not a studio. My phone can record the same way as this can. I do not like this mic, and I do not recommend it. Sorry to be so negative! This is a perfect review of this product, thank you!!! @Baileyyy I think you’re going to sound like you recorded in a home when you record in a home. Mics capture the sound around them, and they aren’t magic. Great review. I am having trouble with mic muting my speakers when I plug it in. Strange. But overall a great review. I recommend you do a youtube video as well. An Excellent and Not pre-opinionated review at last, thank you very much!!! I can hardly wait for the delivery of my iPad camera connection kit to start trying it out on my iPad. I am slightly worried though, it seems that, or there are “rumours” on the internet that apparently, due to a power-limitation in the latest iPad O/S, the mic may not work on an iPad 2 as the mic requires too much power apparently, so Hopefully, fingers crossed, this is not the case, and I will soon be on my way using this mic on my iPad 2. Does anyone know if this will work with Android tablets? If so, is there an adapter that is needed? Thanks in advance for any help you can provide. It (black version) is on sale today for $39.99 at Amazon.com. I do some voice over work and the time came to start looking into mid-range mics. Not really wanting to go with one that required phantom power to operate, I began researching USB models. Not wanting to wait for it to be shipped, I was left with very few choices in both mics and local retailers that carry them in stock. Here in Southern California that meant Radio Shack and Best Buy. Radio Shack was first on the list due to its close proximity to my house. They had 1 USB mic in stock. Paying $100 for a USB mic that bore the brand name “Radio Shack” didn’t really do it for me. What would I say to clients who request a list of my recording/editing equipment? And they do on occasion. Being on this end of the working relationship, well aware of the makeshift “home studio” setup, I KNOW I would want a list of my freelancer’s equipment AND a pic of them in their studio or recording area holding a sign with my name written on it .. just to be sure! Next I headed to Best Buy. When asked if I needed assistance, I said, “Yes! Can you point me to your mics please?” He stood there totally perplexed for a few seconds until the lightbulb went off, “Follow me!” False alarm. No mics. “Hmm maybe we moved ’em.” Let’s try over here. Follow me.” Zilch! He asked a co-worker. We were directed to what I believe used to be the sound or listening room back in the day. Much of it glass enclosure. Merchandise everywhere .. no apparent order to it. A little of this. A little of that. Mish-mash all stacked atop one another. We go to the the glass case. Small boxed items. Inside there are (2) Samson Meteor Mics and (1) Samson Meteorite Mic. Both prices for clearance. Took both out of the box. Considered pricing. Compared specs. Visualized a typical workday with each. Where would it sit? How long was the cord? Would it work with my Mac? Himmed and Hawed I bought the Meteor Mic for $69 clearance. No returns for 2 reasons. (1) Best Buy was purging all mics (and guitars and similar) from the retail stores hence the clearance price; (2) California Law allegedly prohibits the return of any microphone to the place of purchase. A mouth/germ thing? Id never heard of such a thing! If it’s factual, I can totally understand. I know I dont wanna put my mouth that close to where some stranger had his or her mouth! Pretty gnarly! 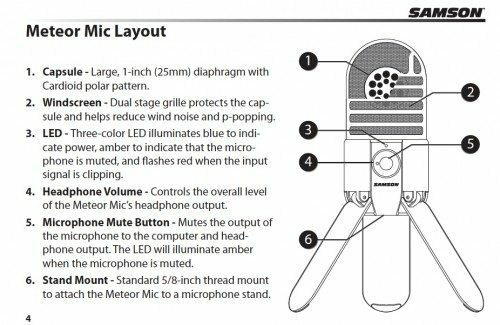 The Samson Meteor Mic looks kinda neat to a lot of people (looks like a parody or gag mic if u ask me. Having worked 15 years in radio, I’d never brag, boast or even casually mention that I’m using this mic. The Meteor Mic is sensitive as all getout! Too sensitive. It hears better than your mama. People talking in the next room, even in the living room, two rooms away. It picks up the extremely soft whirring sound of a 6″ stick fan that sits 10-12 feet away. Of course it gets the sound of the fans in my macbook .. hence the reason I wanted something with a long cord … I have the Mac on one side of the room and I sit on the other side with the Meteor Mic, a copy stand and whatever given script Im working on. I enclose my mac in 4 walls of foam egg crate with a pillow over the top for complete enclosure. Over on my side, I elevate and tilt the Meteor Mic using a combination of several blocks of foam egg crate and pillows. The Meteor picks up vibrations if the surface it’s sitting on is tapped or touched. Putting at least a towel between the surface area and the Meteor alleviates that problem. It also pics up your movement. Brush your hand across your arm, its a do-over. Change your sitting position, it’s a do-over. Chair makes a noise, it’s a do-over. Perhaps my biggest complaint with the Meteor Mic, with regard to its sensitivity is not just plosives (words containing the letter P, etc where most mics, but ESPECIALLY the Meteor Mic amplifies the “P” sound so much that its the focal point of the given word and very distracting/annoying to the listener. The use of Pop Filters has pretty much done away with that. You’ll never hear plosives in radio or televisions .. mics are guarded with pop filters .. also keeps peoples germs and mouth mist from taking up residence in a studio mic where multiple folks use the same mic. MOUTH NOISES .. UGG! 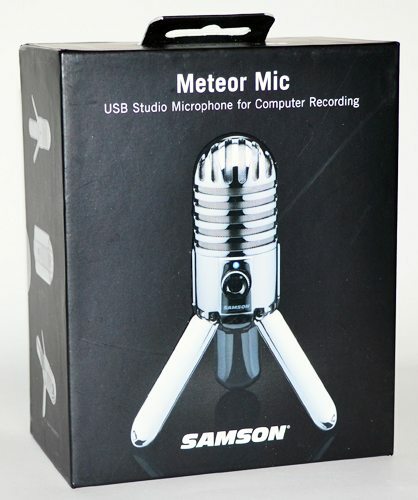 THIS IS, BY FAR, THE BIGGEST DOWNFALL OF THE SAMSON METEOR MIC. I DO NOT TAKE PRESCRIPTION (OR ANY OTHER) MEDICATION. I DO NOT GET DRY MOUTH, NOT EVEN IN STRESSFUL/NERVOUS SITUATIONS. I HAVE ALWAYS STAYED WELL-HYDRATED. NOBODY HAS EVER COMMENTED THAT MY MOUTH EMITS POP/WET SOUNDS! BECAUSE IT DOESNT! I WAS ON-AIR FOR THE LAST 8 OF MY 15 YEARS IN RADIO. I DONT PRODUCE MOUTH NOISES —— BUT I DO ON THE SAMSON METEOR MIC! AND ITS REALLY GROSS ACTUALLY! I GET SLIGHTLY SICK TO MY STOMACH WHEN I HEAR, NOTICE SOMEONE’S DRY MOUTH AND IT’S REALLY GRODY. I have made pop filters … (easy as 1-2-3 to make) — single, double, triple layer .. to no avail … “click” “smack” “smack” “PPPPP” “kkkk” .. edit edit edit edit … valuable waste of limited precious time, easily doubling the time I need to allot to projects/assignments/gigs and I do not like that at all. Has anyone experienced this problem and, if so, have you tried different things .. most importantly did you come up with a solution that doenst included procuring a new mic????? Optimal distance from the Meteor? Angle of the Meteor? I’ve even put a pantyhose leg over the Meteor and used a double layer pop filter and NOPE … “pop” “crack” “smack” EWWW! man im sorry this wound up so lengthy. i think i needed to vent! Butch and Janet .. especially Janet since it is your voice heard on the samples .. your recording sounds pretty good .. i definitely hear the difference and recognize and relate to it as your equip is the same as mine (MBP vs MeteorMic). You say you’re about 6″ with mouth level in line with the middle of the Meteor Mic. Did you do any processing, editing or make any enhancements or are your samples dry/raw voice? I’m going to shut up now .. too much backstory .. coulda just asked the question(s). eh maybe someone out there will find it helpful. I know I woulda. Yes, the same problem… the mic is NOT GOOD. @Liz I did no processing of the recording at all. I simply held the mic in front of my mouth by one of its legs and talked. There were no shields of any type on the mic and no editing of any type done to the file. my microphone the LED show red.. why? Do you need an amp at all for it, or does it work without? I have purchased two of these, sending one back for repair. It all seems to go well, then the red light shows, and it will not disappear. meaning there is a fault with the device. I’ve tried millions of things as suggested on YouTube and blogs, but still…no blue light. A overpriced, rubbish MIC.